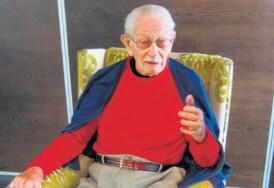 Norman Gordon died a week ago aged 103. The last survivor from the famous, some might say infamous Timeless Test, the last man alive to play Test cricket before World War Two, with his passing a link to cricket’s past is severed. And Gordon, whose renowned physical fitness allowed him to bowl 92 eight ball overs in that contest, was unlucky: war intervened and prevented him from touring England in 1940, where he would doubtless have done well. So his international career ended when the players shook hands and MCC left to catch their boat home. He played in all five Tests of that five Test series, but no other matches for his country, and that puts him in an unusual club, whose members I’m going to take a look at here. I should say two things at the outset: one, that I’m almost certainly guilty of omitting someone – please by all means point them out to me in the comments box – and two, that there are more of these players than I envisioned. I thought I might have ten cricketers to write about – it turns out that there are that many for England alone (although England have more than anyone else). The question for me is why would someone be picked to play throughout a five Test series, and then never get picked again? Looking at the names, and in particular when they played, the answer seems to be one of circumstances: they were picked for a touring side, in a party smaller than usually travel today, in an age when it was almost impossible to reinforce that squad. Having no more than twelve or thirteen to choose from, of whom one or two may have been incapacitated anyway, the captain – who probably had no say in that player’s selection – had no choice but to keep picking him. Many of these men played more than a century ago but there are also recent examples, at least two who will be remembered by most fans today. Chris Adams England in South Africa, 1999-2000. The former Derbyshire batsman and Sussex captain appeared in ODIs against South Africa in 1998 and was picked for his only full tour the following year, making his debut in the same match as Michael Vaughan. It was the memorable Test at Johannesburg when England were reduced to 2 for 4; indeed it was Adams who walked out at number six to face that scoreline. He did at least help to stop the rot on that occasion but with just 104 runs in eight innings he could have no complaint about not getting another chance. He later led Sussex to two Championship titles, and had a much-publicised but notably unsuccessful spell as manager at Surrey. One of a number of 19th-century players, and one who was really nothing more than a name to me. Eschewing his first name of Norman, he averaged 66 for Cambridge University in 1897, when performances in university cricket were noticed a good deal more than today. He went to Australia with Andrew Stoddart’s team (although Archie McLaren captained in the first Test) and did reasonably well, reaching double figures in each of his nine innings and making 64 in the final Test at Sydney. He also made 109 against New South Wales. But as an amateur he was doubtless prevented from playing regularly and at home the selectors had many other options. The only England cricketer to be born on January 1st, he continued to turn out for Surrey until 1913. As Wisden put it, ‘the youngest of seven brothers, all good cricketers at Repton.’ The almanack omits to mention whether they managed to secure seven brides. This was another Cambridge man, although unlike Druce he’d put in a few seasons of county cricket at Middlesex before travelling to Australia, again with Stoddart, in 1894. Four years earlier for Cambridge he hit 191 in a total of 703-9 against Sussex – this was the highest total in English first-class cricket at the time. In Australia he started well enough with 30 and 48, in the remarkable match which Australia lost after making 586 and forcing England to follow on, but tailed off and averaged only 18 in the series. Poor health forced him to give up regular cricket after 1899, although he lived for another forty years. Yorkshire-s first-choice wicket-keeper for a decade, he was succeeded by his brother David, who had a much longer career but never represented England. Joe Hunter batted at number 11 in each Test in Australia and in his second match scored 39 not out, adding 98 for the last wicket with Johnny Briggs. He dropped out of county cricket at the age of 31 and was dead less than four years later. One of a handful of Scotsmen to play for England, the Edinburgh-born Kennedy gave thirty years of service to Hampshire, for whom he took more than 2000 of his 2874 first-class wickets, often carrying the attack with Jack Newman. His Tests were played in South Africa, and he took 31 wickets in the series, including eight on debut and at least five in every match. It does seem extraordinary that he never got another chance, but England had no home Tests in 1923, and there was also Maurice Tate. A Yorkshireman who played for Surrey (and also, early in his career, for WG Grace’s London County), Lees was a quick bowler who took eight or more wickets in an innings seven times in his career. He was another who did well in the Cape; under Plum Warner he took 26 wickets in a series dominated by the home side’s four googly bowlers. He died of pneumonia in 1924. The Middlesex captain who succeeded Plum Warner captained England on his Test debut, and throughout the first series played by England in South Africa after the Great War. Unlike many amateur skippers he was well worth his place, making 84 at Durban and 59 at Johannesburg and averaging 35 for the series. However England lost the series 4-1 and Mann was not picked again. His son George also led his country, also on debut and also in South Africa, 26 years later. The elder Mann continued to play for Middlesex until 1933. Now here we have a real museum piece – the last man to regularly bowl underarm in professional cricket. He went to Cambridge but didn’t play regular county cricket with Worcestershire until 1902, by which time he was 27. Unusually for a ‘lob’ bowler, he tended to bowl off-breaks, and found success on the matting wickets in South Africa, when his 23 wickets cost him just 18 apiece. Six for 43 in the first match established his place for the rest of the series, but the selectors decided not to continue with him back in England, although he’d also been successful against the 1909 Australians. He was a good enough batsman to make three hundreds, including 105 out of 140 for Worcestershire against Oxford. No England player had taken more first-class wickets – more than 1400 – without winning a Test cap than the 35-year-old Sussex medium-pacer when he was picked for his only senior tour in 1964. In that season he’d made headlines taking 10 for 49 against Warwickshire – the last Englishman to take all ten for eighteen years – but that was one more than he managed in five Tests, on surfaces so unresponsive that the young Geoffrey Boycott was also frequently called into action. Thomson retired at the end of the following season but made a surprise comeback for two games in 1972. There follow four Australians, five South Africans, one New Zealander, two Indians and one Pakistani – and quite a few familiar names. The only man on this list who has any chance of escaping from it, and one of the few who was playing at home. Bailey was picked on the strength of stellar form in one-day international cricket, the selectors overlooking a modest record in the Shield. He made a few starts against Alastair Cook’s men, and proved a live wire in the field. The highlight of his series was a 28-run flogging of Jimmy Anderson’s final over at Perth, but by the end of the series his was the place that looked most vulnerable, and he was duly left out of the squad for South Africa. Now almost 32, his chance may not come again, but he should be a fixture in the one-day side for a while yet. The opening bowler from New South Wales had a brief career which was over before he turned 28, but he played a full part in Bob Simpson’s side’s tour of England in 1964, taking 44 wickets in 19 matches but just 12 at 37 in the five Tests. He cleaned up the tail at Lord’s to finish with four for 60, and overall did a capable holding job but not showing enough penetration to persuade the selectors to give him further opportunities. The South Australian paceman was picked for the 1972 tour of England where he failed to make the Test side – Lillee and Massie took the new ball throughout – but got his chance the following year in the Caribbean when Massie lost form and Lillee was injured. Wisden reported that after dismissing Kallicharran in the second match, he ‘Immediately became a different bowler. From somewhere, he found an extra half yard of pace and became little short of genuinely quick.’ Despite his 15 wickets, it was Max Walker with 26 who was the real discovery of the series and went on to enjoy an extended career. One of the first to earn the tag ‘mystery spinner’ and anyone who wants to know more about his remarkable career is directed to Gideon Haigh’s excellent book of that name. The Victorian played in the Ashes against Freddie Brown’s men, taking 21 wickets, but was a little less effective towards the end of the series. Should he have been picked for England in 1953? It’s something which was much discussed at the time; the result might well have been different if he’d been included. His career was over soon after, and twenty years later this complex man shot himself. But he has a place in Ashes folklore. The gigantic opening bowler from Rhodesia took 31 wickets against the visiting Australians, his eight for 53 in the second Test being the best performance by a fast bowler for South Africa in Tests. He maintained good form for a few years after that; on the face of it he was a baffling omission from the tour of England where he would surely have been effective, in 1965. The previous winter he’d taken five wickets against Mike Smith’s MCC team in their opening tour match. Harold Geoffrey Owen-Smith, to give him his full name, played, aged 20, on the tour to England in 1929 where he made 252 runs in the series, including 129 at Headingley. Largely on the strength of this he was chosen as one of Wisden‘s Five Cricketers of the Year. He returned to England the following year to study medicine at Cambridge, played for the University with distinction, and in later years appeared for Middlesex; but made no further appearances for his country despite extending his first-class career until 1950. The best batting performance of anyone on this list: Van der Bijl made 460 runs at 51 in the high-scoring series that Gordon toiled in. In the final, timeless Test, he shared in opening partnerships of 131 and 191 with Alan Melville, his captain. But the war robbed him of what would surely have been productive years, as well as further caps. One of the worst touring parties ever to visit England tried out a number of young players – Mr D’Arcy was one of those thrown in at the deep end. He made a reasonable start to the series with 91 runs in four innings, but afterwards managed only 45 in six. On the eve of the second Test, when he made his best score of 33, he learned of the death of his father. His record in domestic cricket wasn’t a great deal better as he finished with a career average of just 23. A wicket-keeper who was tried in the West Indies in 1971 when Farokh Engineer was briefly unavailable, he also toured England later that year as Engineer’s deputy. Despite never managing a hundred he batted in every position for Hyderabad during his career, and his 218 victims included no fewer than 68 stumpings. Punjabi was an opening batsman who partnered Pankaj Roy in every Test in Pakistan in 1954-55, but he managed just 164 runs in ten innings with a best score of 33. Cricinfo noted his death in October 2011 aged 90, but it hasn’t yet been recorded in Wisden for some reason. Finally, we come to the sole Pakistan representative. Nazar played in his country’s inaugural series against India, faced their first ball in Test cricket, and in the next match scored Pakistan’s first Test hundred, with an unbeaten 124, carrying his bat at Lucknow. His son Mudassar was a regular from 1977 to 1989; indeed Nazar was the team batting coach when Mudassar was first picked. He died in his home town of Lahore in 1996. With the gradual disappearance of the five Test series – even England and South Africa no longer play them, and India may not want to attempt another – I don’t expect to see this list extended very often in the coming years. Nevertheless a statistical quirk has thrown together some interesting, and in some cases distinguished, individuals. The passing of Norman Gordon seems as good a time as any to remember them. Also, Lawrence played against NZ in 1961-2, not Australia in 1963-4. Didn’t Godfrey play against New Zealand NOT Australia? Well dug out Andrew, and yes Godfrey did play against NZ in ’61-62. Makes it all the more surprising that he didn’t feature against the Aussies two years later. Mason was a well known name in his time, a notable captain of Kent and more recently the subject of a book by his grandson John Lazenby.